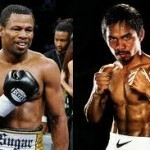 The decision to pit up Manny Pacquiao with Shane Mosley is a bitter pill to swallow with some notable boxing writers and some desperate aficionados who wanted to pit up instead with either Juan Marquez or Andre Berto for Pacquiao. Their disappointment is understandable though, they should not forget that professional boxing is business. An entity and a medium for prizefighters to earn a living. They fought mainly for the money and prestige. They fought inside the squared ring to establish their reputation while at the same time earning their hard earned money through the proceeds generated from the gates and pay per view (PPV). Any boxing promoter of course, would choose the best monetary option for his fighter and subsequently the fighter himself would confirm in return if he approves the fight. Anyone who has the right frame of mind would likely choose of what is best for him and that’s how Pacquiao-Mosley entangle came into being. It is not for everyone to dictate of what they want but its the marketability issue of the fight that dictates the bout. Besides, there are a lot of people around the world as well as African Americans and other nationalities in the US wanted to see how Pacquiao fared with African American fighters with the likes of Mosley’s caliber. 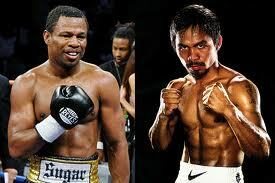 With Floyd Mayweather’s Jr. reluctance to fight Pacquiao, Mosley whom Pacquiao has not fought before or any African American fighter in his resume’, is the nearest proposition and a good option to happen in lieu of the failed Mayweather bout. Though they say Mosley is a shot fighter, his previous two fights with Mayweather and Mora respectively, which both ended on a not impressive performance of Mosley, this is, however, not enough to negate his competitiveness as a fighter. 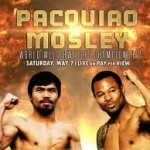 If their reference that Pacquiao could easily overcome Mosley as he did it to Margarito they will be dead wrong, because Mosley, a slick boxer, with a balanced offense-defense in his arsenal could easily adjust to any situation to negate his disadvantage against Pacquiao inside the ring while Margarito, a warrior and a slugger and being a one dimensional fighter at that, does not. Most sluggers usually ended their fights with their faces badly bruised while boxers applied the pure science of boxing “to hit but not be hit,” they ended up their faces unbruised. If Pacquiao wins against Mosley, it would neutralize Pacquiao’s reputation that he has only the Mexican numbers with him where he earns the tag as the mexicutioner in defeating them, but if Pacquiao defeats Mosley, he would be at par with the African American elite fighters who have been dominating in essence, the pure science of boxing. 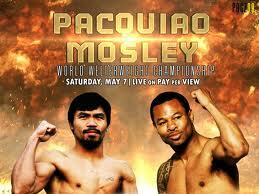 As Pacquiao has said, there’s no easy fight for him whenever he is in the ring. He stakes his life and his future. He considers every fight as risky as most of his other fights. However, this is a test for Pacquiao’s skill as a fighter, if he can defeat Mosley with ease more than that of what Mayweather Jr. did. Well, it is safe to say that Mayweather Jr. is damn right for not accepting the challenge of Pacquiao, believing in his mind that he would eventually lose the fight once they clashed. As of this time, neither the big money nor honor of being the GOAT or any prestigious title at stake could entice Mayweather Jr. into the ring with Pacquiao. For the meantime we will just leave Mayweather Jr. alone and let the ghost of Pacquiao continues to haunt him as long as he lives, which is a better consolation for him than squaring off with the p4p king.